Some things in Okinawa are free for the taking. Treasured memories can be stored on the disc drive of your mind by simply opening your eyes. Let me take you on a simple drive (though no drive is simple in Okinawa) to a tiny island connected to the shore by three small bridges. The island town is named Ikei Island, and the serenity and quiet of this tiny isle is worth the exploration. Many of you have seen this isle off to the left while driving to White Beach. One the way, you will pass many local Japanese who fish off the waters near the bridges-wearing their typical layered fashions of plaids and stripes in their matching blues, greens and purples. Many are decked with over-sized bonnets while many don the straw cone-shaped variety that one typically sees in China. Their faces barely visible, I often wonder how they stay cool under all of the layers. If you take the time, you can emerge from your car and easily zoom in for a close shot nearly every time without being noticed. Continuing further over the bridges to this tiny fishing village you will pass brilliant turquoise waters shimmering in the sun. Early morning trips before 0900 on weekends are more serene as many Japanese take advantage of sleeping in late on the weekends. 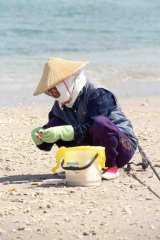 Occasionally you will see people wading in the waters, picking up what looks like mussels or small clams into the buckets that they carry. After passing over the final bridge, turn to the right and park by the boats near the outskirts of town. There is a new beach area which circles around to the left of the town. By mid-morning the new stone pier will be filled with fishermen with long poles stretching out to the sea. It's a pretty sight. Small shops facing the beach have been recently set up along this area for those who get hungry for soba, soda or beer. Tables have been set out in front of many of the new shops to welcome a visit and share a smile or two with these local residents. Now, in order to experience the town, you need to walk on the narrow roadways between the many rows of homes. Venture through the tiny walkways between walls of concrete and share this world for a few minutes. Happy children riding on bikes along the streets will pretend to hide from you as you wave hello. You will pass wall upon wall of fishing nets that have been strung out for drying after the early morning boats returned from their catch. Smiles will emerge from homes as the unfamiliar voices in English are heard outside of their open homes. When walking around this town, I am surprised that I am always the only non-resident. Usually I walk with the interest of a tourist, but with the caution of an intruder who likes to stay unidentified. I always bring one of my children who want to "explore" for the day. Armed with my camera and a child by my side, I can appear to be interested in small child-chatter while admiring the sights around me. Walking quietly outside on the sandy roadways you might see locals laying on their tatami mats or eating at their tables on the floor. Most homes are open to the air and you can see the entire interior of their homes at a glance. A cement wall that sits in front of their open doorways protects all of the homes. This affords their privacy, as does the tall walls surrounding each home. Several locals might be seen as you pass them along the way. They readily respond to a friendly "kanichiwa", but care should be taken to preserve their privacy as you stroll from street to street, appearing interested without appearing nosy. I have often wondered if they too were just as curious about me as I was about them as we exchanged shy gestures of hello between us. There is a small, very old temple located on one of the back streets near the town school. The school sits behind a large soccer field and on weekends appears abandoned with no visible signs of life. An occasional dog can be heard barking as you pass along on your walk. If you look about, you will notice the difference in architecture as modern homes and modern roofs replace the old familiar tiled ones with Shi-Shi dogs of long ago. Now, shiny enameled blue and green figurines decorate the more expensive homes that slowly and methodically replace the older ones. If you close your eyes, you can hear the sounds of insects and birds all around. The scent of fire burning from a nearby sugar cane field reminds me of my youth when leaves piled high in heaps burned on curbsides in the autumns on Long Island. Our children will never experience these smells of yesterday. Our society has made everything so aseptic and sterile that these scenes that were part of my past are non-existent in the world we know-scenes that are alive in every part of Okinawa today. After walking for a while through the town, you might want to stop into one of the local Mom and Pop shops near the parking area. Very old women sit very quietly and proudly showcase their wares of canned foods, dried fish, soba, chips and soda pop. After taking several cold cans out of the small refrigerator in the store, I stopped to get a photo of a friendly, timid but smiling lady who sat patiently waiting for the yen to emerge from my purse. Such an old store with so many memories, so many owners and so much dust that you wonder just how long the cans have been on the shelves and just how old the food might really be. Thoughts of the lineage, which brought this lady to her store, enter your mind and you make the assumption that her past and her future lie in the present. She leads a simple life and yet seems content. The little metal box that holds the change is an antique. She gives you your change as you wonder how this life could bring anyone the peace you feel while visiting her. After asking her for a picture, she shyly agrees. Once the picture was taken, a few simple gestures were exchanged as I turned to leave her tiny, dimly lit store. To my surprise, her gaze left mine as she turned to watch a small, colorful screen that was sitting on top of the far darkened counter. She was watching the final soccer match of the Olympics. She made a kind gesture for me to join her, so I popped my soda and guzzled one down as we enjoyed the match together. Our worlds for a brief moment in time seemed not so very different after all!